This is a tutorial,with examples and detailed solutions, on how to multply and simplify rational expressions. 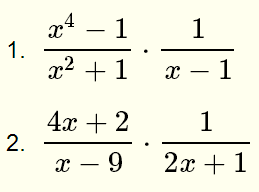 Multiply the numerator of the first expression by the numerator of the second, and the denominator of the first expression by the denominator of the second. Note that -x + 2 = - (x - 2) in the numerator. 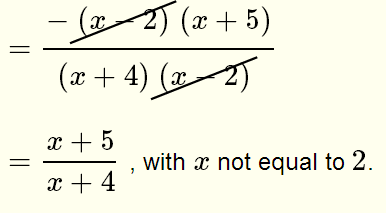 Factor terms in the denominator. Cancel common factors to simplify the expression. More references to topics related to rational expressions.